Fairlawn Mansion, Superior’s enduring landmark along the East Second Street waterfront, was declared the grandest home in the city at the time of its construction. The 1889 family home of Martin and Grace Pattison and their six children, the 42-room Victorian-era Queen Anne house is the embodiment of America’s Gilded Age and has been featured on an episode of the A&E network’s American Castles. Now a museum, the mansion has a long and unique history which cannot be told without first telling the story of the man who built Fairlawn—adventurer, captain of industry, millionaire, politician and philanthropist Martin Pattison. Martin Pattison was born Simeon Martin Thayer, on January 17, 1841, in southern Ontario, Canada, either in Niagara or Haldimand County. The family trees of his mother Emmarilla Pattison and Benjamin Franklin share common roots. Thayer’s father was the namesake and descendent of General Simeon Thayer, famous for his gallant defense of Fort Mifflin in the Revolutionary War. Thayer’s family left Canada sometime around 1853, settling on a farm in Sanilac County, Michigan. At the age of 17, uninterested in farming, Thayer went to work in a logging camp. Within ten years he and an Irish immigrant named Joseph Murdock became partners in a lumber business near Minden City, Michigan. On August 7, 1869, Thayer married his business partner’s sister, Isabelle Murdock. Less than five months later the couple welcomed their first child, a daughter named Zelia. “Shotgun” marriages such as the Thayers’ were not uncommon for the times, and Thayer suffered no adverse consequences in either his business or personal life because of the impropriety. In fact, he served six years on the Minden City School Board, four of them before he was married or had children. In 1871 Thayer was elected to the Michigan State Legislature. At the age of 31, by all appearances he was a genuinely respected businessman and civic leader with a bright future. There seemed no explanation why, on the last day in April of 1872—just six days before the birth of his son Joseph—Thayer departed for business in Port Huron and from there disappeared, seemingly, from the face of the earth. According to all published accounts through 1890, a lumberman named Martin Pattison arrived in the city of Marquette, Michigan, in the fall of 1872 with his younger brother, William Pattison, and the two entered into a lumber and mining business. In November of 1879, at the age of 38, Martin Pattison wed Grace Emma Frink, the 23-year-old daughter of Reuben Mather Frink, a Great Lakes lighthouse keeper. They moved to Superior, Wisconsin, and lived in an unassuming but comfortable home on West Third Street in the city’s East End. William soon followed and the Pattison brothers established a white-pine-logging operation along the Black River south of Superior. The Pattisons were the first to use the waterway, a branch of the Nemadji River, for floating logs. In 1879, Pattison moved his operation’s headquarters to Duluth. Early in 1890 Pattison was arguably at the pinnacle of his popularity among his peers and the residents of Superior. He and his wife Grace were respected leaders and philanthropists in the community; both were active in civic and charitable organizations. By all accounts, the two could not have been more highly regarded—nor more ripe for a fall when an old skeleton came rattling out of Pattison’s closet. The couple was later seen at the Cadillac Hotel in Lexington, Michigan. They proceeded to Port Huron where Pattison allegedly absconded with a good portion of the cash payment for the season’s logs from his partner’s labors—Murdoch reportedly did most of the heavy work in their partnership, leaving the paperwork to Pattison. From there the couple is said to have traveled to Chicago and then to Salt Lake City where Simeon Martin Thayer obtained a document of divorce before traveling further to California. The couple surfaced again in Marquette later that year, living as Martin and Martha Pattison until Martha’s death in 1877. According to the story, Pattison’s future wife Grace Frink was employed as Martin and Martha’s housekeeper at the time. It was at this time that Joseph Murdoch first confronted his former partner and brother-in-law, allegedly demanding a sum of money from Pattison for the care of Isabelle and her children—along with the promise they would keep quiet. Years later, when Pattison’s name again came to Murdoch’s attention through widely published accounts of Pattison’s great financial success and civic achievement, Murdoch became distraught at the thought of his former brother-in-law living in the lap of luxury while never having done right by Isabelle. Again Murdoch pled on behalf of his sister. A legal action for divorce was filed with Isabelle as the plaintiff on the grounds of desertion. The divorce was granted in June, 1890, along with a financial settlement, creating the evidence necessary for a dogged reporter to reveal Pattison’s duplicity. However, the scandal proved of little consequence to Pattison’s public reputation and his continued role in Superior’s industrial growth at the cusp of the 20th century. 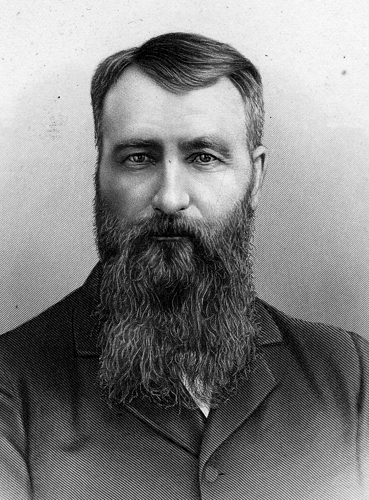 He not only won Superior’s mayoral election that year (succeeding the city’s first mayor, Alexander McRae) but was re-elected in 1891 and again in 1896. Martin, Grace and their first four children—Martha, Byron, Ethel, and Alice—took up residence in their magnificent mansion before the year ended. Grace would later give birth to two sets of twins, Myrna and Verna then Lois and Leda. Verna and Leda both died in infancy. One of Pattison’s most noted acts of philanthropy was the donation of land along the Black River south of Superior. In 1917 Pattison became aware of the plan to build a power dam on the site. The proposed dam would destroy Big Manitou Falls—the fourth highest waterfall east of the Rockies. He secretly purchased parcels amounting to 660 acres, much of it land he and his brother had previously sold off when they quit the lumber business. In 1918 he donated this land for public use, saving the waterfall and surrounding forest. Martin Pattison died in his home at the age of 77 on December 20, 1918. He had shown no signs of ill health until days before his demise. On his final day he complained of weakness but expected to be up and attending to business as soon as his malaise passed. The Superior Evening Telegram reported that, “Turning on his pillow [Pattison] went to sleep thereby peacefully and beautifully passing out of this life into the Great Beyond.” He is buried in Greenwood Cemetery, south of Superior and just miles from his beloved Big Manitou Falls. On January 20, 1920, Wisconsin dedicated its sixth state park—a tract of land now 1,436 acres in size, including two waterfalls, a lake, and numerous hiking trails—and named it Pattison State Park. The remains of Martin and William’s logging camp can still be seen on the Logging Camp Trail. Grace and her youngest daughter, Lois, vacated Fairlawn later that year, moving to California for Lois’s health. She donated the mansion to the Superior Children’s Home and Refuge Society. Martin Pattison received a second posthumous honor on December 14, 1920, when Superior opened its newest grade school, located on North 21st Street. School board officials had been unable to agree on a name for the school until the very last hour. In a meeting that went late into the night on the eve of the grade school’s opening, they finally agreed that it would bear the name of Martin Pattison. Their decision was based on the benevolence and good will Martin and Grace extended to the city throughout their residency in Superior.